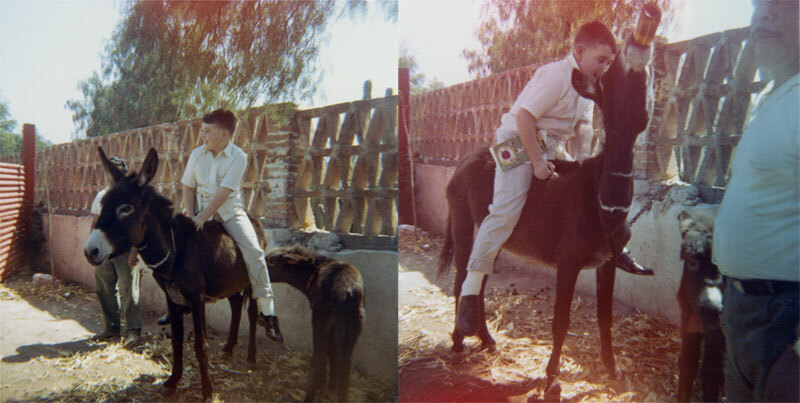 I’ve been going through a bunch of old family photos, and I found a couple of surprising photos of me, taken on a family vacation to Mexico in 1968, when I was barely 9 years old. Until I saw these photos, I had completely suppressed all memory of this event, but the moment I saw them, I remembered it instantly. In the first photo, my Dad put me on top of a burro to take my picture. There’s a little baby burro nipping at my legs, I remember being a bit unnerved at sitting on a stinky burro with another little animal trying to bite me, but I am smiling and seem to be enjoying it. Then all of a sudden, the burro’s owner gave it a bottle of beer, and it reared its head up to guzzle it down. I look like I’m trying to figure out how to get off this crazy animal. There is one other event in this photo that is not visible. This is the moment I decided I hated having my picture taken.